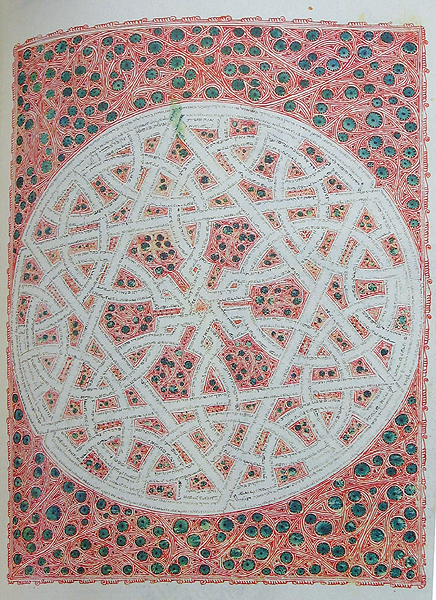 This is my intepretation of a pattern from a carpet page of the Kennicott Bible, one of the greatest examples of medieval Spanish book binding extant. It was illuminated and designed by Joseph Ibn Hayyim and was published in 1476 a mere 16 years before the edict of expulsion. The original was done in Micography, unique to the Jews at that time. Click here to see Ibn Hayyim's version. I altered some of the lines so that I could make them interlace consistently. There are a number of possible color variations, all of which greatly change how this pattern is perceived. 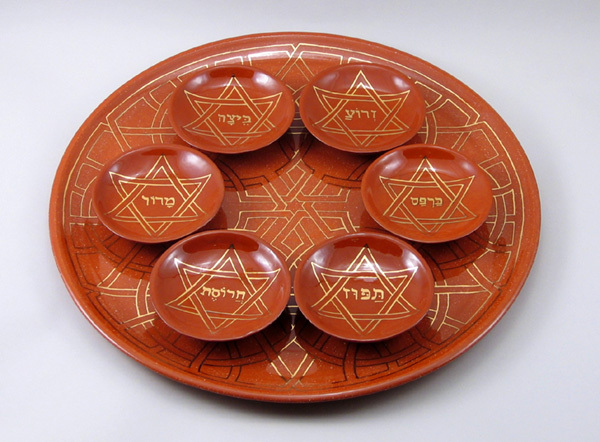 This is the Seder set version of this pattern in Red and Gold. Seder plates are around 15" in diameter. They are wired through the foot on the reverse so that they can be hung on the wall for the rest of the year. Shipping a piece can take anywhere from a couple of weeks to a couple of months depending on where I am at in my firing schedule and whether I have one of that pattern made already. I ship anywhere in the contiguous US for $25.